The entire management area extends to around 140,000 hectares or 346,000 acres. The Group has 26 members covering 32 estates. There are two estates within the Group area which do not participate but which provide information via the relevant Sub Group (both in the East Sub Group area). The membership is wide and diverse, including community and crofter landowners, the John Muir Trust, Scottish Wildlife Trust and Forest Enterprise as well as private landowners, large and small. As a result of this, there is a significant diversity in management objectives within the Group and the preparation of deer management plans has been quite a challenge. 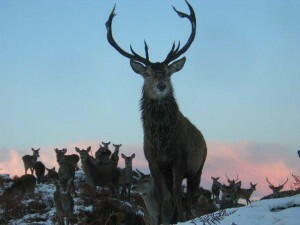 In 2014, four separate Sub Groups were established – North, South, East and West (also known as Assynt Peninsula) – which approximately take into account what are considered to be separate deer populations, though it is accepted there will be some movement of deer between the Sub Group areas. Contact details for member estates are available by contacting the Secretary (see Contact page).